A long-standing vegetarian, Jeremy Corbyn is now apparently considering becoming a vegan. The Labour leader is a committed defender of animal rights, who joined the League Against Cruel Sports at school, and became a vegetarian at the age of 20 after working on a pig farm. 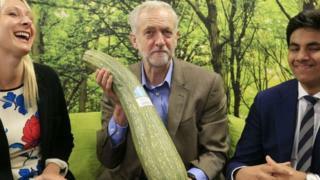 He grows a fair proportion of his food on his allotment. Mr Corbyn now says he is "going through the process" of changing his diet because dishes that do not include eggs or milk have improved. In the notoriously bloodthirsty world of politics, leading vegetarians have been surprisingly rare over the years, but Mr Corbyn isn't the first high-profile politician to forego the culinary pleasures of the flesh. A moderate Conservative politician who became a noted Speaker of the House of Commons, Weatherill was unafraid to stand up to Margaret Thatcher when she dominated the House of Commons with a landslide majority. He became a vegetarian after serving as a soldier in India during World War Two. Based in Bengal, Weatherill embraced the local culture, learning Urdu and taking up meditation. His vegetarianism was a reaction to the great suffering he witnessed during the Bengal famine of 1943, in which an estimated 2.1 million people died, some from starvation and others from diseases such as cholera, malaria, smallpox and dysentery. Cripps was chancellor in Labour prime minister Clement Attlee's government, which took power in the immediate aftermath of World War Two. He was famous not only for his austere policies, designed to help Britain recover from the ravages of war, but for his equally austere lifestyle. Despite being a wealthy man, he led a frugal existence and coupled his vegetarianism with being teetotal. He also gave up his one known vice - smoking. Winston Churchill was unimpressed, remarking as Cripps passed by one day: "There, but for the grace of God, goes God." Cripps suffered for many years from colitis, an inflammation of the lower bowel that was aggravated by stress. In 1950, his health broke down and he was forced to resign, dying from cancer two years later. Jeremy Corbyn's close friend and political soulmate, Tony Benn served as a cabinet minister under Harold Wilson and James Callaghan, and came very close to winning the deputy leadership of the Labour party in the early 1980s. He became a vegetarian in his 50s - following the example of his son and fellow Labour politician, Hilary. "I never liked meat - and my son Hilary, 30 years ago, said, 'If the world ate the grain instead of feeding it to animals and killing them, there would be enough food for everybody,'" Benn told the Independent in 2006. "That moment my wife and I became vegetarian and I have never touched meat since." A junior minister in the Thatcher governments, but more famous as a political diarist, for his interesting love life, and as a man with an extremely pithy turn of phrase. Pilger: "I read that you were a vegetarian and you are seriously concerned about the way animals are killed." Pilger: "Doesn't that concern extend to the way humans, albeit foreigners, are killed?" One of the most significant figures in the Labour movement, the radical pacifist served as general secretary and chairman of the Independent Labour Party in the 1930s. He gave up meat as a young man in 1908, but found that the practice was not widely embraced by the Labour movement, noting in the 1930s that most people were too busy trying to ward off hunger to pay much attention to the source and ethics of their food. Speaking in a House of Lords debate on animal cruelty decades later, he said: "I am a vegetarian and I have been so for 70 years. On the whole, I think, physically I am a pretty good advertisement for that practice." Brockway went on to live for another decade, dying just months before his 100th birthday. What? That Bill Clinton? The former President of the United States with a particular weakness for fast food? (Who can forget his sneaky trip to McDonald's while visiting the Labour conference in 2002?). Well, yes. Mr Clinton adopted a vegan diet in 2010 on medical advice after undergoing emergency surgery for chest pains and credits it with giving him a new burst of energy. "I have more energy. I never clog. For me, the no dairy thing, because I had an allergy, has really helped a lot. And I feel good," he has been quoted as saying. "I like all the Italian stuff. Lasagne. I like the chilli enchiladas - they nailed the meat substitute stuff. It used to be when I started this, it was inedible. It's so much better now." Vegans, though, were unimpressed by his admission that he still occasionally eats fish: "Eating salmon and avoiding most animals food products does not make you a vegan, it means you eat less animal products." Other prominent vegetarian politicians past and present include Tim Farron, the former Liberal Democrat leader, whose diet didn't necessarily go down well with some of the farmers in his rural Cumbrian constituency, Caroline Lucas, co-leader of the Green Party, her predecessor as party leader Natalie Bennett and Conservative MP Henry Smith, who chaired the all-party parliamentary group for animal welfare. Among his comrades will be Labour MP Kerry McCarthy - who spent a year as shadow Environment, Food and Rural Affairs Secretary after being appointed by Mr Corbyn despite being a vegan in 2015 - current shadow Wales Secretary Christina Rees is also a vegan, as is shadow minster Chris Williamson and new Labour MP Darren Jones.